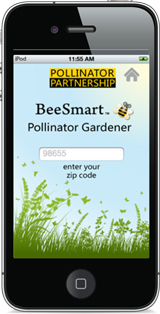 It’s National Pollinator Week, and now we can all Bee smart, because there’s an app for that! Yes, really. The next time you are shopping for plants, you will be able have help in figuring out the plants you can use in your very own garden to help pollinators the most. Available on both Android and IOS platforms, it covers almost 1,000 plants native to the United States; by entering your zip code you can refine your search to local eco-regions, too. The app includes plant images, botanical and common names, allows you to filter your plants by what pollinators you want to attract, and by what your light and soil requirements are. So many things we can’t change or fix, but we can all plant a few things that support our native pollinators now that we learning so much about how important they are to our own future.